HOW TO USE: Take this medication by mouth with or without food, usually once daily or as directed by your doctor. Swallow the capsules whole. Do not crush or chew the capsules. Doing so can release all of the drug at once and may increase your risk of side effects. Your doctor may gradually increase your dose. Follow your doctor's instructions carefully. Dosage is based on your medical condition and response to treatment. Use this medication regularly to get the most benefit from it. To help you remember, use it at the same time each day. It is important to continue taking this medication even if you feel well. Most people with high blood pressure do not feel sick. For the treatment of high blood pressure, it may take 2 to 4 weeks before you get the full benefit of this drug. This medication must be taken regularly to prevent angina. It should not be used to treat angina when it occurs. Use other medications (such as nitroglycerin placed under the tongue) to relieve an angina attack as directed by your doctor. Consult your doctor or pharmacist for details. Tell your doctor if your condition worsens (for example, your chest pain worsens or your routine blood pressure readings increase). DRUG INTERACTIONS: Your doctor or pharmacist may already be aware of any possible drug interactions and may be monitoring you for them. Do not start, stop, or change the dosage of any medicine before checking with your doctor or pharmacist first. Before using this medication, tell your doctor or pharmacist of all prescription and nonprescription/herbal products you may use, especially of: amiodarone, digoxin, fingolimod. Other medications can affect the removal of diltiazem from your body, which may affect how this medication works. Examples include atazanavir, cimetidine, quinidine, St. John's wort, azole antifungals such as ketoconazole, macrolide antibiotics such as erythromycin, rifamycins including rifabutin and rifampin. 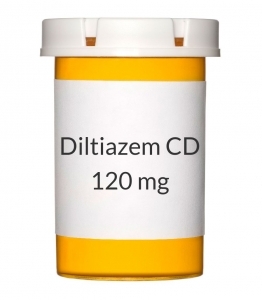 Diltiazem may also affect how your body gets rid of many drugs (such as buspirone, cyclosporine, sirolimus, certain statins including lovastatin, certain anti-seizure drugs including carbamazepine, certain benzodiazepines including triazolam and midazolam). Check the labels on all your medicines (such as cough-and-cold products, diet aids, nonsteroidal anti-inflammatory drugs-NSAIDs such as ibuprofen for pain/fever reduction) because they may contain ingredients that could increase your blood pressure or heart rate. Ask your pharmacist about using those products safely. Cimetidine is a nonprescription drug that is commonly used to treat extra stomach acid. Because cimetidine may interact with diltiazem, ask your pharmacist about other products to treat extra stomach acid. This document does not contain all possible interactions. Therefore, before using this product, tell your doctor or pharmacist of all the products you use. Keep a list of all your medications with you, and share the list with your doctor and pharmacist.